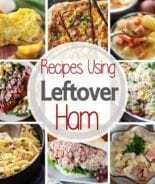 Looking for a delicious dinner recipe? 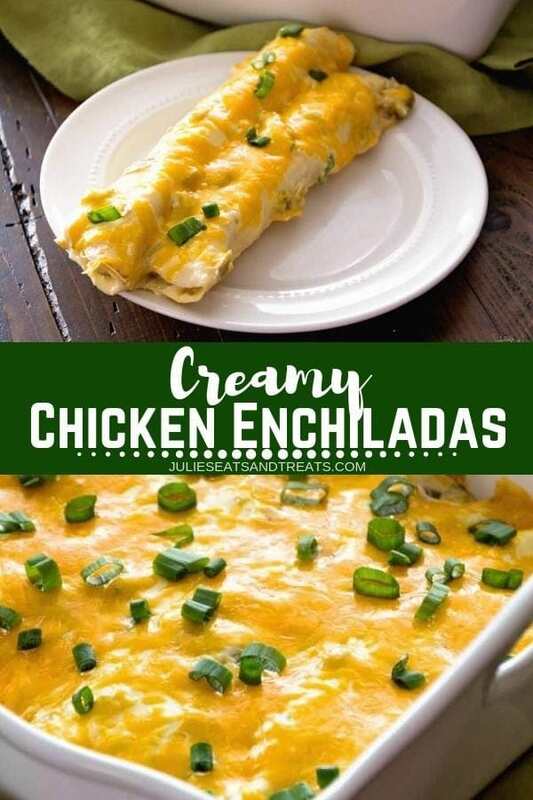 These creamy chicken enchiladas are amazing! I’ve become known for them in my family and everyone makes sure to show up when I serve them for dinner! They are so creamy and delicious. This will be the last enchilada recipe that you’ll ever try! Spice up your dinner routine with this easy recipe. It will become a go-to recipe in your recipe box as soon as you try them. So hard to believe another weekend is coming to an end. They always seem to go way to fast and the week drags on forever. I probably didn’t help that I worked Saturday. I was getting a little bit spoiled having three Saturdays off in a row due to the holidays. I’ve been baking up a storm on my weekend off. I’ve made a delicious Chicken Taco Soup finished off with Soft Sugar Cookies with my amazing Sugar Cookie Frosting, Peanut Butter Ritz Cookie which are a family favorite, and my favorite Peanut Butter Cup Cookies! Now it’s back to reality and working every other Saturday, which is a lot better than before. I was working three in a row, then one off so I’m thankful for every other Saturday! When I work so much on weekend we love this Baked Chicken, but when I have some more time it’s Chicken Enchiladas that I love! Jason went to Sioux Falls on Saturday to help his sister move into the condo she just bought. So happy for her just wish I could have got to see it too! He was there all day and didn’t get back until late on Saturday night (long after I was in bed!). So on Saturday night I treated myself to a girls night alone with a glass of wine and hogging the TV 🙂 Well that was in between doing dishes and laundry. You just can’t ever seem to get a night totally to yourself! But on those nights I do, I love to curl up with a great meal, that’s why these AMAZING Creamy Chicken Enchiladas are on the menu! They are my favorite right along with this Chimichanga recipe. 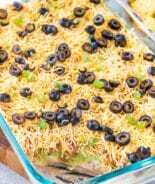 Are chicken enchiladas made with corn or flour tortillas? 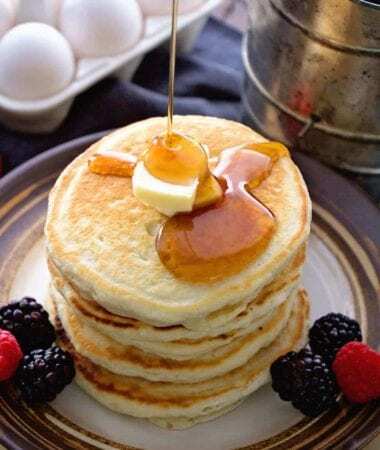 Really it’s your choice – in this recipe I use flour, but you can certainly use corn if that’s what you prefer! 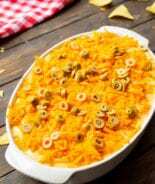 What cheese is used in enchiladas? 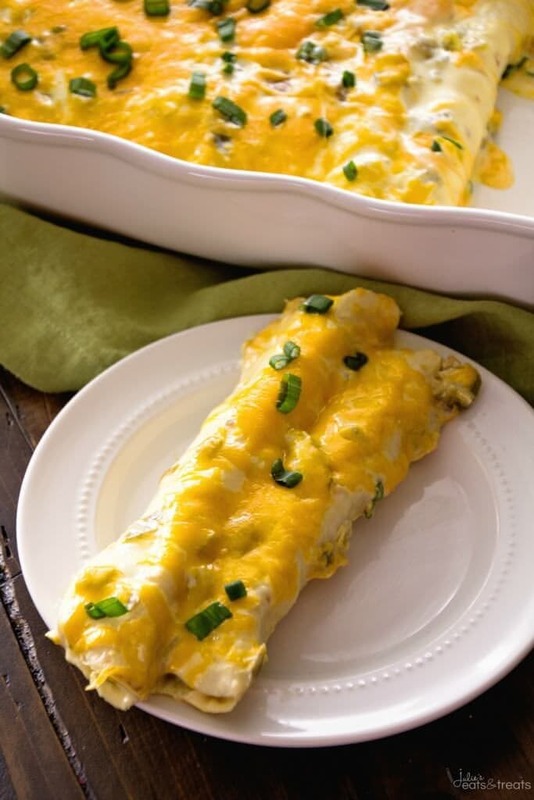 Cheddar, jack and queso are all cheeses that melt easily and are great choices for enchiladas! Cojita cheese is a salty, crumbly cheese and makes a delicious topping! What goes well with creamy chicken enchiladas? If you haven’t tried making enchiladas before please give it a go! 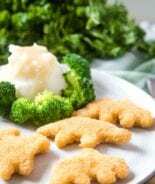 They are one our favorite recipes now. In fact my brother makes sure to show up at our house whenever he hears these are going on the menu that night. Growing up my Mom was more of a meat and potatoes kind of dinner person. I love making new recipes like enchiladas. Guess what? She even loves them! Getting out of your box isn’t so bad after all! 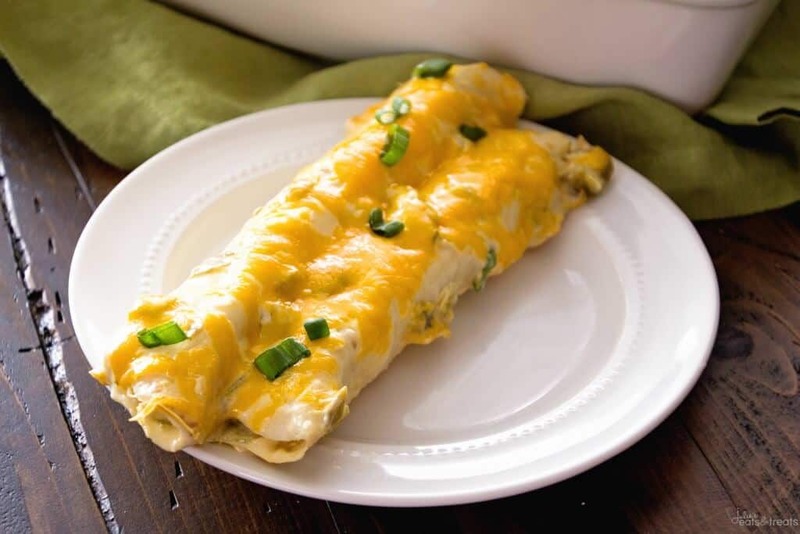 They also love to come over when I make these Green Chile Chicken Smothered Burritos! How do you make easy enchiladas? Mix the cream cheese, water, onion powder, cumin, salt and pepper until smooth. Stir in chicken. Spoon about 1/4 cup of the chicken mixture down the center of each tortilla. Roll up enchilada and place seam side down in the baking dish. Next combine the soup, sour cream and chilies, pour over enchiladas. Bake, uncovered, until hot and bubbly. Sprinkle with cheese, bake 5 minutes longer or until cheese is melted. You’re going to love this delicious comfort food! It’s really one of our favorites. And leftovers on day two? Even better! 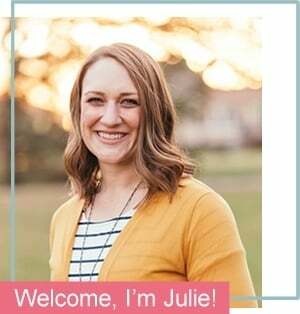 Snap a pic so I get to see it and tag me @julieseatsandtreats or #julieseatsandtreats – it’s so good, I know you’ll love it! Delicious chicken enchiladas perfect for a dinner recipe! 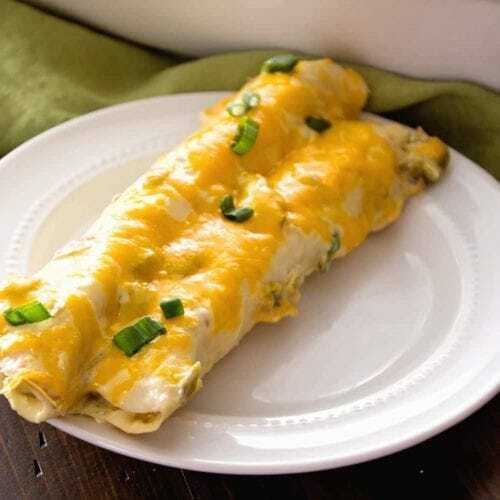 These creamy enchiladas are stuffed with chicken, green chiles, cheese and topped with a creamy sauce and cheese! In a large mixing bowl, beat the cream cheese, water, onion powder, cumin, salt and pepper until smooth. Stir in chicken. Place 1/4 cup of the chicken mixture down the center of each tortilla. Roll up and place seam side down in a greased 13 in x 9 in baking dish. 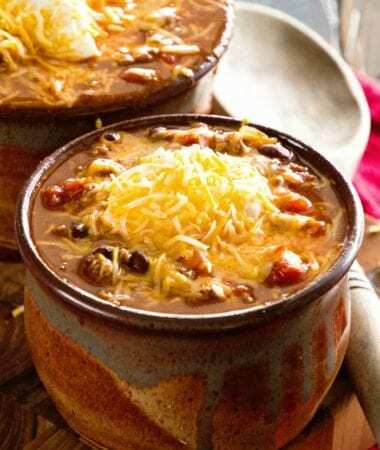 In a bowl, combine the soup, sour cream, and chilies, pour over enchiladas. Bake, uncovered, at 350 degrees for 30-40 minutes or until heated through. 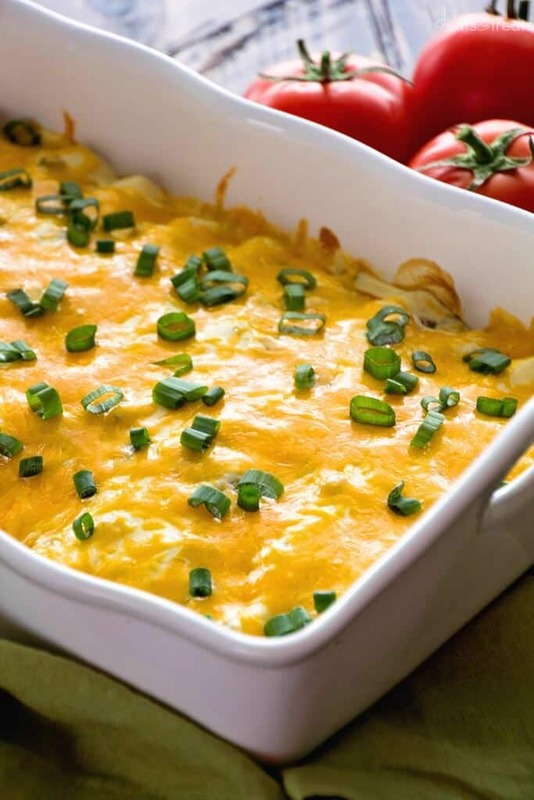 Sprinkle with cheddar cheese, bake 5 minutes longer or until cheese is melted. Holy cow. I seriously want to dive heard first into that beautiful cheesy perfection. These look SO good! YUM! 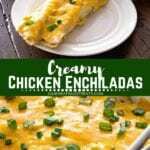 These are the best creamy enchiladas that I’ve tried! Definitely going to make them again. My husband loooooves chicken enchiladas, and I’ve only ever made them at home a handful of times. But it’s going to change now! These look so good! Thank you so much sharing! Yes you do these are the best! AWESOME!!! This was amazing! So easy and delish! I added some hatch green chili salsa to the mix as well! This is my new go to for potluck and a last minute rotisserie chicken usage!! So glad you enjoyed it! Great additions! 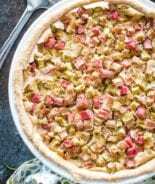 Is the chicken cooked separately beforehand and shredded or cubed or just put in raw and go into the oven? Cooked like it states in the ingredients. Quick, easy and tasty. This was a hit with my family!